Submerge yourself in the refreshing waters of Xel-Há and snorkel in a crystal clear lagoon during an all-inclusive full-day trip from Playa del Carmen. Explore the iridescent waters of a natural inlet for diverse marine life; discover secret caves and secluded beaches; and float down a river in a tube for a truly relaxing ride. When huger strikes, feast upon delicious local specialities at authentic Mayan restaurants, sampling fresh seafood and traditional Mexican fare. Convenient round-trip transportation from your Playa del Carmen hotel is included in the tour. 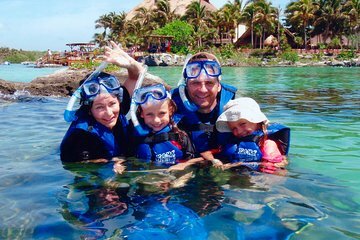 Ideal for families, this Xel-Ha package includes everything, even hotel transfers, so there’s no hidden costs. Depart from your Playa del Carmen hotel and enjoy a relaxing 35-minute ride in a comfortable minivan. Arrive at the picturesque park of Xel-Há, a natural aquarium situated on the Riviera Maya, and revel in the exciting options your all-inclusive day pass affords you. Set out to explore the natural wonders of the park and marvel at the distinct landscape of Xel-Há’s lagoons; admire the rugged rock formations and sparkling cenotes as you discover this delightful destination. Consult your pocket map then stroll over to the principle lagoon. Don professional snorkelling gear (rental free but deposit required) and plunge into the inviting waters to explore the magnificent marine life within. Swim past troves of tropical fish as you immerse yourself in the turquoise tranquillity of the water. Next, take a tram or cycle to the top of the relaxing river. Climb into an inner tube and commence a gentle journey downstream, languidly floating past atmospheric mangroves and unique flora. Muster your courage and jump from a crumbling cliff into the water below during your float. Journey deep into the heart of the jungle on one of Xel-Há’s wildlife trails; observe fascinating flora and fauna like lizards, birds and iguanas as you wander past secretive cenotes and underground caves, discovering the hidden secrets of this enthralling eco-system. Rest and revitalize on one of the parks many comfortable loungers, all of which afford gorgeous views of the surrounding scenery. When hunger strikes, venture to one of five restaurants to feast upon local and international specialities; your all-inclusive pass includes food and beverages. Sip refreshing soft drinks or ice-cold beers before sampling Mayan specialities, juicy burgers and fresh seafood. When the park closes, return to your comfortable minivan to enjoy the short return journey back to your Playa del Carmen hotel, where the tour concludes. The park is well-planned and well-managed. There are plenty of stations with lockers, restrooms, showers, and changing rooms, and plenty of activities for all ages. The river float alone was worth the price of admission. This park is so BEAUTIFUL! So much to do and the bike zip line was an amazing experience! The snorkeling was better there than in the ocean! Over priced additions available when you enter the property, but just about the best days anyone can have! A great experience while in Mexico. Transportation was great to and from Xel-Ha. Great excursion.... the staff was very friendly and nice. The kids had a blast. Loved the ziplining and the crew loved the cliff jumps. Lots of walking but you get to enjoy the views. Would def recommend this to all. Had a brilliant day but the water was murky so visibility was really bad. Snorkelling was a bit pointless. The food in all the restaurants was amazing. Very efficient ie lockers, snorkeling equipment etc. Definitely worth doing. Lot's of fun activities to do and the tour guide was very helpful with explaining the extras.